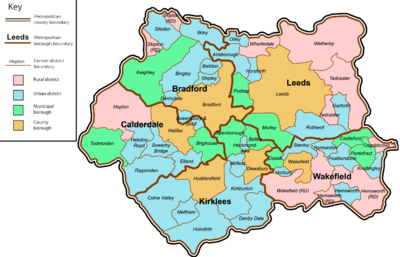 This is a list of the wool, cotton and other textile mills in the Bradford: The metropolitan borough of the City of Bradford includes the Bradford and Keighley with Baildon, Bingley, Denholme, Ilkley, Queensbury and Shelf, Silsden and Shipley and the former rural district of Skipton. ^ "NBR62408". Yorkshire Industrial Heritage. ^ "NBR62425". Yorkshire Industrial Heritage. ^ "NBR62418". Yorkshire Industrial Heritage. ^ "NBR62420". Yorkshire Industrial Heritage. ^ "NBR62409". Yorkshire Industrial Heritage. ^ "NBR62421". Yorkshire Industrial Heritage. ^ "NBR62410". Yorkshire Industrial Heritage. ^ "NBR62419". Yorkshire Industrial Heritage. ^ "NBR62406". Yorkshire Industrial Heritage. ^ "NBR62473". Yorkshire Industrial Heritage. ^ "NBR62514". Yorkshire Industrial Heritage. ^ "NBR62475". Yorkshire Industrial Heritage. ^ "NBR62560". Yorkshire Industrial Heritage. ^ "NBR62562". Yorkshire Industrial Heritage. ^ "NBR62586". Yorkshire Industrial Heritage. ^ "NBR62536". Yorkshire Industrial Heritage. ^ "NBR62534". Yorkshire Industrial Heritage. ^ "NBR62584". Yorkshire Industrial Heritage. ^ "NBR62622". Yorkshire Industrial Heritage. ^ "NBR62539". Yorkshire Industrial Heritage. ^ "NBR62525". Yorkshire Industrial Heritage. ^ "NBR62528". Yorkshire Industrial Heritage. ^ "NBR62559". Yorkshire Industrial Heritage. ^ "NBR62508". Yorkshire Industrial Heritage. ^ "NBR62526". Yorkshire Industrial Heritage. ^ "NBR62527". Yorkshire Industrial Heritage. ^ "NBR62623". Yorkshire Industrial Heritage. ^ "NBR62504". Yorkshire Industrial Heritage. ^ "NBR62505". Yorkshire Industrial Heritage. ^ a b "NBR62533*". Yorkshire Industrial Heritage. ^ "NBR2524". Yorkshire Industrial Heritage. ^ "NBR62625". Yorkshire Industrial Heritage. ^ "NBR62626". Yorkshire Industrial Heritage. ^ "NBR62624". Yorkshire Industrial Heritage. ^ "NBR62588". Yorkshire Industrial Heritage. ^ "NBR62538". Yorkshire Industrial Heritage. ^ "NBR62537". Yorkshire Industrial Heritage. ^ "NBR62557". Yorkshire Industrial Heritage. ^ "NBR62561". Yorkshire Industrial Heritage. ^ "NBR62530*". Yorkshire Industrial Heritage. ^ "NBR62532". Yorkshire Industrial Heritage. ^ "NBR62587". Yorkshire Industrial Heritage. ^ "NBR62583". Yorkshire Industrial Heritage. ^ "NBR62558". Yorkshire Industrial Heritage. ^ "NBR62540". Yorkshire Industrial Heritage. ^ "NBR62580". Yorkshire Industrial Heritage. ^ "NBR62549*". Yorkshire Industrial Heritage. ^ "NBR62575". Yorkshire Industrial Heritage. ^ "NBR62571". Yorkshire Industrial Heritage. ^ "NBR4". Yorkshire Industrial Heritage. ^ "NBR62556". Yorkshire Industrial Heritage. ^ "NBR62631". Yorkshire Industrial Heritage. ^ "NBR62669". Yorkshire Industrial Heritage. ^ "NBR62682". Yorkshire Industrial Heritage. ^ "NBR62574". Yorkshire Industrial Heritage. ^ "NBR679". Yorkshire Industrial Heritage. ^ "NBR62552". Yorkshire Industrial Heritage. ^ "NBR672". Yorkshire Industrial Heritage. ^ "NBR62614". Yorkshire Industrial Heritage. ^ "NBR62576". Yorkshire Industrial Heritage. ^ "NBR62551". Yorkshire Industrial Heritage. ^ "NBR62630". Yorkshire Industrial Heritage. ^ "NBR62548". Yorkshire Industrial Heritage. ^ "NBR62555". Yorkshire Industrial Heritage. ^ "NBR3". Yorkshire Industrial Heritage. ^ "NBR62492". Yorkshire Industrial Heritage. ^ "NBR62612". Yorkshire Industrial Heritage. ^ "NBR577". Yorkshire Industrial Heritage. ^ "NBR62572". Yorkshire Industrial Heritage. ^ "NBR62485". Yorkshire Industrial Heritage. ^ "NBR62579". Yorkshire Industrial Heritage. ^ "NBR62613". Yorkshire Industrial Heritage. ^ "NBR62518". Yorkshire Industrial Heritage. ^ "NBR62491". Yorkshire Industrial Heritage. ^ "NBR62495". Yorkshire Industrial Heritage. ^ "NBR62496". Yorkshire Industrial Heritage. ^ "NBR62608". Yorkshire Industrial Heritage. ^ "NBR62621". Yorkshire Industrial Heritage. ^ "NBR62670". Yorkshire Industrial Heritage. ^ "NBR62553". Yorkshire Industrial Heritage. ^ "NBR62604". Yorkshire Industrial Heritage. ^ "NBR62519". Yorkshire Industrial Heritage. ^ "NBR62517". Yorkshire Industrial Heritage. ^ "NBR62629". Yorkshire Industrial Heritage. ^ "NBR62554". Yorkshire Industrial Heritage. ^ "NBR62550". Yorkshire Industrial Heritage. ^ "NBR686". Yorkshire Industrial Heritage. ^ "NBR62493". Yorkshire Industrial Heritage. ^ "NBR62628". Yorkshire Industrial Heritage. ^ "NBR62573". Yorkshire Industrial Heritage. ^ "NBR62547". Yorkshire Industrial Heritage. ^ "NBR62610". Yorkshire Industrial Heritage. ^ "NBR62684". Yorkshire Industrial Heritage. ^ "NBR62494". Yorkshire Industrial Heritage. ^ "NBR62578". Yorkshire Industrial Heritage. ^ "NBR62520". Yorkshire Industrial Heritage. ^ "NBR62611". Yorkshire Industrial Heritage. ^ "NBR62683". Yorkshire Industrial Heritage. ^ "NBR685". Yorkshire Industrial Heritage. ^ "NBR62615". Yorkshire Industrial Heritage. ^ "NBR62516*". Yorkshire Industrial Heritage. ^ "NBR62470". Yorkshire Industrial Heritage. ^ "NBR62471". Yorkshire Industrial Heritage. ^ "NBR62474". Yorkshire Industrial Heritage. ^ "NBR62405". Yorkshire Industrial Heritage. ^ "NBR62487". Yorkshire Industrial Heritage. ^ "NBR62501". Yorkshire Industrial Heritage. ^ "NBR62484". Yorkshire Industrial Heritage. ^ "NBR62617". Yorkshire Industrial Heritage. ^ "NBR62488". Yorkshire Industrial Heritage. ^ "NBR62415". Yorkshire Industrial Heritage. ^ "NBR62426". Yorkshire Industrial Heritage. ^ "NBR62451". Yorkshire Industrial Heritage. ^ "NBR62489". Yorkshire Industrial Heritage. ^ "NBR62448". Yorkshire Industrial Heritage. ^ "NBR62531". Yorkshire Industrial Heritage. ^ "NBR62502". Yorkshire Industrial Heritage. ^ "NBR62522". Yorkshire Industrial Heritage. ^ "NBR62523". Yorkshire Industrial Heritage. ^ "NBR62450*". Yorkshire Industrial Heritage. ^ "NBR62529". Yorkshire Industrial Heritage. ^ "NBR62444". Yorkshire Industrial Heritage. ^ "NBR62428". Yorkshire Industrial Heritage. ^ "NBR62452". Yorkshire Industrial Heritage. ^ "NBR62619". Yorkshire Industrial Heritage. ^ "NBR62483". Yorkshire Industrial Heritage. ^ "NBR62449". Yorkshire Industrial Heritage. ^ "NBR62453". Yorkshire Industrial Heritage. ^ "NBR62455". Yorkshire Industrial Heritage. ^ "NBR62454". Yorkshire Industrial Heritage. ^ "NBR62500". Yorkshire Industrial Heritage. ^ "NBR62620*". Yorkshire Industrial Heritage. ^ "NBR62427". Yorkshire Industrial Heritage. ^ "NBR62447*". Yorkshire Industrial Heritage. ^ "NBR521". Yorkshire Industrial Heritage. ^ "NBR62503". Yorkshire Industrial Heritage. ^ "NBR62607". Yorkshire Industrial Heritage. ^ "NBR62616". Yorkshire Industrial Heritage. ^ "NBR62413". Yorkshire Industrial Heritage. ^ "NBR62499". Yorkshire Industrial Heritage. ^ "NBR62497". Yorkshire Industrial Heritage. ^ "NBR62490". Yorkshire Industrial Heritage. ^ "NBR62486". Yorkshire Industrial Heritage. ^ "NBR62446". Yorkshire Industrial Heritage. ^ "NBR62535". Yorkshire Industrial Heritage. ^ "NBR62498". Yorkshire Industrial Heritage. ^ "NBR62609". Yorkshire Industrial Heritage. ^ "NBR62618". Yorkshire Industrial Heritage. ^ "NBR62445". Yorkshire Industrial Heritage. ^ "NBR62443". Yorkshire Industrial Heritage. ^ "NBR62480". Yorkshire Industrial Heritage. ^ "NBR62441". Yorkshire Industrial Heritage. ^ "NBR62417". Yorkshire Industrial Heritage. ^ "NBR62422*". Yorkshire Industrial Heritage. ^ "NBR62478". Yorkshire Industrial Heritage. ^ "NBR62442". Yorkshire Industrial Heritage. ^ "NBR62477". Yorkshire Industrial Heritage. ^ "NBR62476". Yorkshire Industrial Heritage. ^ "NBR62439*". Yorkshire Industrial Heritage. ^ "NBR62479". Yorkshire Industrial Heritage. ^ "NBR62481". Yorkshire Industrial Heritage. ^ "NBR62482*". Yorkshire Industrial Heritage. ^ "NBR62515". Yorkshire Industrial Heritage. ^ "NBR62513". Yorkshire Industrial Heritage. ^ "NBR62440*". Yorkshire Industrial Heritage. ^ "NBR62424". Yorkshire Industrial Heritage. ^ "NBR62423*". Yorkshire Industrial Heritage. ^ a b Giles & Goodall 1992, p. 224. ^ a b c d e f g h i j k l m n o p q r s t Giles & Goodall 1992, p. 227. ^ a b c d e f g h i j k l m n o p q r s t u v w x y z aa ab ac ad ae af ag ah ai aj ak al am an ao ap aq ar as at au av aw ax ay az ba bb bc bd be bf bg bh bi bj bk bl bm bn bo bp bq br bs bt bu Giles & Goodall 1992, p. 228. ^ a b c d Giles & Goodall 1992, p. 234. ^ a b c d e f g h i j k l m n o p q r s t u v w x y z aa ab ac ad ae af ag ah ai aj Giles & Goodall 1992, p. 236. ^ a b c d e f g h Giles & Goodall 1992, p. 237. ^ a b c d e f g h i j k l m n o p q r Giles & Goodall 1992, p. 241. ^ Davis, Mark. "James Drummond – Lumb Lane Mills, Bradford". Mark Davis photoography. Retrieved 30 January 2016. Wikimedia Commons has media related to Mills in Bradford.